Quick Search for properties in the Loop. Click on the links below. The Loop is what locals call the historical center of downtown Chicago. 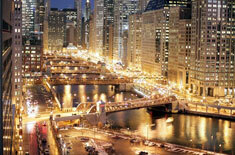 It is the second-largest central business district in the United States, after Midtown Manhattan. Bounded on the west and north by the Chicago River, on the east by Lake Michigan, and on the south by Roosevelt Road, the value of its real-estate shaped an architectural style dominated by high-rises. Notable buildings include the Home Insurance Building, considered the first skyscraper; the Chicago Board of Trade Building, a National Historic Landmark; and the Sears Tower, the tallest in the United States. Some of the historic buildings in this district were instrumental in the development of high-rises. Chicago's rational street numbering system originates in the Loop at the intersection of State Street and Madison Street. The term "The Loop" has different meanings. The boundaries as designated by the City of Chicago are the Chicago River to the north and west, Roosevelt Road to the south, and Lake Michigan to the east, though the original boundary is strictly the area circled by the elevated CTA tracks. As the downtown area and its many high-rises expanded out past the community area over the years, "The Loop" has been used more generally to denote the entire downtown as opposed to just the community area. The term even more specifically applies to the section of the community area surrounded by the circuit formed by Chicago's 'L' trains. The circuit runs along Lake Street on the north, Wabash Avenue on the east, Van Buren Street on the south, and Wells Street on the west. The name, however, predates the elevated loop, coming from a streetcar loop in 1882. This area has a wealth of shopping opportunities, including the Loop Retail Historic District, although it competes with the more upscale Magnificent Mile area to the north.